JOZO has been adding a pinch of love to lives since 1929. Our long history has made us master the skills of mining and grinding salt to perfection. JOZO Light salt extra fine contains at least 70% less sodium than normal table salt and provides potassium which further contributes to the normal functioning of the nervous system and muscles. JOZO 03 fine salt has a small grain that is easily dissolved and combines flavors. 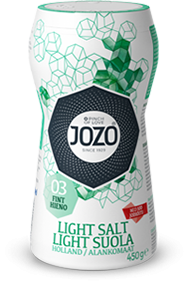 JOZO Light salt is one of the purest types of salt in the world. The salt is sourced in the Netherlands and Denmark from underground deposits created millions of years ago by the evaporation of the Zechstein Sea. Good for your health – potassium and a reduced consumption of sodium contribute to the maintenance of normal blood pressure. Potassium further contributes to the normal functioning of the nervous system and muscles. JOZO contains at least 70% less sodium than normal table salt. A varied and balanced diet and a healthy lifestyle are recommended. Side dish, serves 4, 30 mins.